Each time I fly I always make a point of writing about the most recent flight here on MyFlightBlog.com. In addition to tracking my time on the blog and in my logbook I also update an electronic copy of my logbook using the Logbook Pro software. For the most part the software has been great and provides some great reporting functionality to let me total up hours by month, year or query by aircraft type. One feature though that it was missing was some sort of social integration. That is where Jetrecord has come to the rescue. 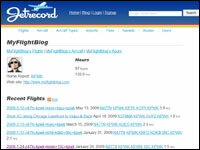 Jetrecord says their service "is to pilot logbooks what Flickr is to photo albums. Log your flights online and share them with friends and family." They recently setup a process to take a file exported from Logbook Pro that will populate your Jetrecord account. I recently served as the test project for this new process and it worked flawlessly. I can now view and share my flight experiences more easily through Jetrecord. If you are logging time I highly recommend you give Jetrecord a look. Thanks for the review, Todd, and thanks for giving Jetrecord a try! I really appreciate your help getting Logbook Pro integrated into Jetrecord. Let me know if there's anything I can do to make Jetrecord better for you as a pilot. Thanks for pointing out this site Todd. I imported my LogShare file over with no problem. I am now on Jetrecord too.